Designed for coats and boots. An attractive cabinet that is inexpensive to make. All solid wood parts can be cut from 1x12 stock. Use plywood or beadboard for the back. 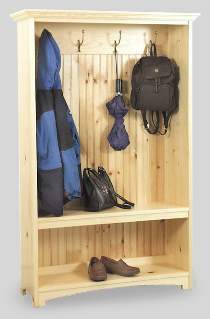 Measures 60"H x 39"W x 12-1/2"D. Order 4 coat hooks separately below.